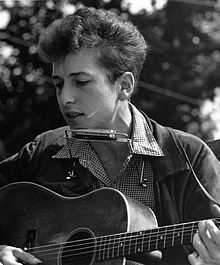 Bob Dylan (born Robert Allen Zimmerman on May 24, 1941) is an American singer–songwriter, author, poet and painter who has been a major figure in popular music for more than five decades. Many major recording artists have covered Dylan's material, some even increasing its popularity as is the case with The Byrds' cover version of "Mr. Tambourine Man". This article is a list of musicians who have recorded and released their own version of a song written by Dylan. Wolfgang Ambros Like a Rolling Stone Recorded as "Allan Wia A Stan"
The Man in Me Recorded as "Da Mensch In Mir"
Drifter's Escape Recorded as "Des Sandler's Flucht"
It Ain't Me Babe Recorded as "Bin's Ned"
Love Minus Zero/No Limit Recorded as "Wahre Liebe"
One of Us Must Know (Sooner or Later) Recorded as "Früher Oder Später"
Temporary Like Achilles Recorded as "Achilles"
She Belongs to Me Recorded as "Sie G'hört Zu Mir"
Don't Think Twice, It's All Right Recorded as "Denk Ned Noch"
Articolo 31 Like a Rolling Stone Recorded as "Come Una Pietra Scalciata"
Hugues Aufray All I Really Want to Do Recorded as "Ce Que Je Veux Surtout"
Ballad of Hollis Brown Recorded as "Ballade de Hollis Brown"
Blowin' in the Wind Recorded as "Dans le Souffle du Vent"
Don't Think Twice, It's All Right Recorded as "N'Y Pense Plus Tout Est Bien"
Forever Young Recorded as "Jeune Pour Toujours"
Girl from the North Country Recorded as ""La Fille du Nord"
Heartland Recorded as "Au Coeur de Mon Pays"
I Shall Be Released recorded as "Nous Serons Libres"
If You Gotta Go, Go Now Recorded as "Si Tu Dois Partir, Va-T-En"
It Ain't Me Babe Recorded as "Ce N'Était Pas Moi"
Knockin' on Heaven's Door Recorded as "Knock Knock Ouvre-Toi Porte du Ciel"
Like a Rolling Stone Recorded as "Comme des Pierres Qui Roulent"
The Lonesome Death of Hattie Carroll Recorded as "La Mort Solitaire de Hattie Carroll"
Maggie's Farm Recorded as "Maggie la Ferme"
Man Gave Names to All the Animals Recorded as "L'Homme Dota d'un Nom Chaque Animal"
Motorpsycho Nightmare Recorded as "Cauchemar Psychomoteur"
Mr. Tambourine Man Recorded as "L'Homme Orchestre"
Outlaw Blues Recorded as "Le Blues du Hors-la-Loi"
Rainy Day Women ♯12 & 35 Recorded as "Tout L'mond' un Jour S'est Plante"
The Times They Are A-Changin' Recorded as "Les Temps Changent"
What Was It You Wanted Recorded as "tra Mais Q'uest-ce Que Tu Voulais?" When the Ship Comes In Recorded as "Le Jour Ou le Bateau Viendra"
With God on Our Side Recorded as "Dieu Est a Nos Cotes"
Mama, You Been on My Mind Recorded as "Daddy, You Been on My Mind"
BAP Like a Rolling Stone Recorded as "Wie 'ne Stein"
Ballad of Easy Rider Co-written with Roger McGuinn. After viewing the end of the film of the same name, Dylan had his name removed from the song's credits. Francis Cabrel She Belongs to Me Recorded as "Elle M'Appartient (C'Est Une Artiste)"
Lay Lady Lay Recorded as "Lay, Baby, Lay (Lay Lady Lay)"
Fabrizio De André Desolation Row Recorded as "Via della Povertà"
Romance in Durango Recorded as "Avventura a Durango"
If You Gotta Go, Go Now recorded in French as "Si Tu Dois Partir"
Don't Think Twice, It's All Right Recording as The Wonder Who? Francesco de Gregori If You See Her, Say Hello Recorded as "Non Dirle Che Non È Così"
Boudewijn de Groot The Times They Are a-Changin' Recorded as "Er Komen Andere Tijden"
The Kingston Trio Mama, You Been on My Mind Recorded as "Babe, You've Been on My Mind"
Kuku Knockin' on Heaven's Door Recorded as "Knockin' on Heaven's Door (A Sight to Rejoice)"
Mirah Love Minus Zero/No Limit Recorded as "Love Minus Zero"
Christy Moore Song To Woody Recorded as "Tribute to Woody"
Lay Lady Lay Recorded as "Lay Baby Lay (Lay Lady Lay)"
Larry Norman When the Ship Comes In Recorded as "The Hour That the Ship Comes In"
Bart Peeters Tangled Up in Blue Recorded as "Prachtig In Het Blauw"
Bart Peeters I Want You Recorded as "Ik Wil Je (Nooit Meer Kwijt)"
S.T.S. Mr. Tambourine Man Recorded as "He, alter Liedersänger"
Ike & Tina Turner She Belongs to Me Recorded as "He Belongs to Me"
Man on the Street Recorded as "The Old Man "
^ Abramson, Lee. "Amazon Music". Retrieved October 31, 2014. ^ Chisling, Matthew. "Adele: 19". AllMusic. Retrieved 2011-02-13. ^ a b c d e f g h i j k l m n o p q r s t u v w x y z aa ab ac ad ae af ag ah ai aj ak al am an ao ap aq ar as at au av aw ax ay az ba bb bc bd be bf bg bh bi bj Erlewine, Stephen Thomas. "Various Artists: Chimes of Freedom: The Songs of Bob Dylan". Allmusic. Retrieved 2012-10-13. ^ a b c "Various Artists: Forever Young: A Tribute To Bob Dylan". Amazon.com. Retrieved 2011-01-29. ^ "Albion Band: Best of 89/90". Amazon.com. Retrieved 2011-01-30. ^ "Kris Allen: Season 8 Favorite Performances". AllMusic. Retrieved 2011-01-17. ^ a b "Eddie Albert: The Eddie Albert Album". Discogs. Retrieved 2011-01-31. ^ Hartenbach, Brett. "Alpha Band: Spark in the Dark". AllMusic. Retrieved 2011-01-30. ^ Widran, Jonathan. "Altan: Another Sky". Allmusic. Retrieved 2010-12-28. ^ a b c d e Luerssen, John D. "Various Artists: Listen to Bob Dylan: A Tribute Album". Allmusic. Retrieved 2015-02-22. ^ Jurek, Thom. "Eric Andersen: The Street Was Always There". Allmusic. Retrieved 2010-12-24. ^ Ruhlmann, William. "Eric Andersen: Waves". Allmusic. Retrieved 2010-12-24. ^ Phares, Heather. "Anika: Anika". Allmusic. Retrieved 2014-11-02. ^ a b "Whatever Colors You Have in Your Mind: A Tribute to Bob Dylan: Various Artists". Allmusic. Retrieved 2010-12-29. ^ a b c d e f g h i j "Grateful Dead Family Discography: It's All Over Now, Baby Blue". deaddisc.com. Retrieved 2009-10-09. ^ a b c d e f g h i j k l m n o p q r s t u v w Erlewine, Stephen Thomas. "Various Artists: I'm Not There". AllMusic. Retrieved 2015-03-22. ^ "Eddy Arnold: Folk Song Book". AllMusic. Retrieved 2011-01-31. ^ a b c d e f g h i j k l m "Grateful Dead Family Discography: Like a Rolling Stone". deaddisc.com. Retrieved 2009-10-26. ^ Unterberger, Richie. "Just the Right Sound: The Association Anthology". Allmusic. Retrieved 2010-12-28. ^ a b c d e f g h i j k l m n o p q r s t u v w x Ankeny, Jason. "Aufray Trans Dylan". allmusic.com. Retrieved 2009-10-24. ^ "Brian Auger: Julie Driscoll & Brian Auger". Allmusic. Retrieved 2010-12-27. ^ a b c d e f g h i j k l m n o p q r Jurek, Thom. "Any Day Now [Bonus Tracks]". allmusic.com. Retrieved 2009-10-14. ^ a b c d e f g h i j "Second Hand Songs". secondhandsongs.com. Retrieved 2009-10-14. ^ Erlewine, Stephen Thomas. "Joan Baez: Rare, Live & Classic". Allmusic. Retrieved 2010-12-31. ^ a b c d e f g "Grateful Dead Family Discography: Forever Young". deaddisc.com. Retrieved 2009-10-11. ^ a b c d e f g h "Grateful Dead Family Discography: I Shall Be Released". deaddisc.com. Retrieved 2009-10-26. ^ a b c d e f Huey, Steve. "Tangled Up in Blues: Various Artists". Allmusic. Retrieved 2010-12-28. ^ a b c d e f g h i j k l m n o p q r s t Ginell, Richard S. "The 30th Anniversary Concert Celebration". allmusic.com. Retrieved 2009-10-13. ^ a b "Bobby Bare: Constant Sorrow". AllMusic. Retrieved 2011-01-31. ^ Owens, Thom. "Bobby Bare: All-American Boy". AllMusic. Retrieved 2011-01-31. ^ a b c d e f g h i j k l m n o p "Grateful Dead Family Discography: The Times They Are a-Changin'". deaddisc.com. Retrieved 2009-10-26. ^ a b c d e f g h "Grateful Dead Family Discography: Mr Tambourine Man". deaddisc.com. Retrieved 2009-10-26. ^ Eder, Bruce. "Beau Brummels: The Best of the Beau Brummels". Allmusic. Retrieved 2010-12-28. ^ a b c d e f g h i j k l m n o p q r s t u v w Jackson, Josh (2009-04-28). "'Paste Magazines's 50 best Dylan covers of all time". Paste Magazine. Retrieved 2009-10-17. ^ Graves, Tom. "Jeff Beck: Jeff Beck Group". Allmusic. Retrieved 2010-12-29. ^ "Harry Belafonte: Homeward Bound". Belafonte Tracks: Discography of Original Recordings. Retrieved 2011-01-10. ^ Leggett, Steve. "Eric Bibb: Diamond Days". Allmusic. Retrieved 2010-12-29. ^ a b c d e f g h i j Campbell, Al. "Blues on Blonde on Blonde". Allmusic. Retrieved 2011-04-04. ^ "Acker Bilk: Stranger on the Shore Live". AllMusic. Retrieved 2011-01-29. ^ "Andrew Bird: Soldier On". AllMusic. Retrieved 2011-01-20. ^ a b c d e f "Grateful Dead Family Discography: Rainy Day Women No. 12 & 35". deaddisc.com. Retrieved 2009-10-26. ^ a b Jurek, Thom. "Mary Black: Full Tide". AllMusic. Retrieved 2011-01-17. ^ "Mary Black: The Circus EP". Mary Black Official Website. Retrieved 2011-01-17. ^ a b c d e f g h i j "A Nod to Bob". Red House Records. Retrieved 2010-12-23. ^ Cater, Evan. "Luka Bloom: Keeper of the Flame". AllMusic. Retrieved 2011-01-17. ^ a b c "Grateful Dead Family Discography: I Want You". deaddisc.com. Retrieved 2009-10-26. ^ Ruhlmann, William. "Michael Bolton: Time, Love & Tenderness". AllMusic. Retrieved 2011-01-20. ^ Huey, Steve. "The Box Tops: The Best of the Box Tops". Allmusic. Retrieved 2010-12-29. ^ Unterberger, Richie. "Bonnie Bramlett: Lady's Choice". AllMusic. Retrieved 2011-01-29. ^ Viglione, Joe. "Brewer & Shipley: Weeds". Allmusic. Retrieved 2010-12-28. ^ "Broadside Electric: With Teeth". Broadside Electric website. Retrieved 2011-02-16. ^ Planer, Lindsay. "Jaime Brockett: Remember the Wind and the Rain". Allmusic. Retrieved 2010-12-28. ^ "David Bromberg: Try Me One More Time". allmusic.com. Retrieved 2009-10-27. ^ Roundup Newsletter. "David Bromberg: Wanted Dead of Alive". Allmusic. Retrieved 2010-12-24. ^ a b c d e "Grateful Dead Family Discography: Don't Think Twice, It's All Right". deaddisc.com. Retrieved 2009-10-30. ^ Planer, Lindsay. "The Brothers Four: Sing of Our Times/The Honey Wind Blows". Allmusic. Retrieved 2010-12-28. ^ "The Browns: This Young Land". AllMusic. Retrieved 2011-01-31. ^ Dryden, Ken. "Ray Bryant: Live at Basin Street". AllMusic. Retrieved 2011-01-31. ^ Greenberg, Adam. "Buckwheat Zydeco: On a Night Like This". AllMusic. Retrieved 2011-01-20. ^ a b c d e f g "Grateful Dead Family Discography: Maggie's Farm". deaddisc.com. Retrieved 2009-10-15. ^ a b "Grateful Dead Family Discography: Quinn the Eskimo (The Mighty Quinn)". deaddisc.com. Retrieved 2009-11-26. ^ a b Wynn, Ron. "Gary Burton: Tennessee Firebird". AllMusic. Retrieved 2011-01-26. ^ "Paul Butterfield: The Legendary Paul Butterfield Rides Again". Allmusic. Retrieved 2010-12-31. ^ a b "Grateful Dead Family Discography: Chimes of Freedom". deaddisc.com. Retrieved 2009-11-26. ^ a b c d e f g h i j k Erlewine, Stephen Thomas. "Stebastian Cabot, Actor/Bob Dylan Poet". Allmusic. Retrieved 2011-03-17. ^ Wynn, Ron. "Shirley Caesar: Rejoice". Allmusic. Retrieved 2011-01-11. ^ a b c d e f g Unterberger, Richie. "Hamilton Camp: Paths of Victory". Allmusic. Retrieved 2010-12-31. ^ Unterberger, Richie. "Hamilton Camp: Welcome to Hamilton Camp". Allmusic. Retrieved 2010-12-31. ^ "Hamilton Camp: Sweet Joy". Allmusic. Retrieved 2010-12-31. ^ a b c d e "Glen Campbell: Mr. 12 String Guitar". Allmusic. Retrieved 2010-12-31. ^ Campbell, Al. "Glen Campbell: The Glen Campbell Collection". Allmusic. Retrieved 2010-12-31. ^ a b c d "Grateful Dead Family Discography: Walkin' Down the Line". deaddisc.com. Retrieved 2010-02-27. ^ a b c d e f g h Leggett, Steve. "Various Artists: Is It Rolling Bob? Dub Versions". AllMusic. Retrieved 2011-01-26. ^ Jurek, Thom. "Deana Carter: The Chain". AllMusic. Retrieved 2011-01-29. ^ Nickson, Chris. "Martin Carthy: Signs of Life". Allmusic. Retrieved 2010-12-27. ^ "Three City Four (featuring Martin Carthy, Roy Bailey and Leon Rosselson)". Amazon.com. Retrieved 2010-12-27. ^ Ankeny, Jason. "Sweetheart: Love Songs: Various Artists". Allmusic. Retrieved 2010-12-28. ^ "Johnny Cash: Johnny & June". Allmusic. Retrieved 2010-12-28. ^ Leggett, Steve. "Rosanne Cash: The List". Allmusic. Retrieved 2010-12-28. ^ "Bob Dylan: The Collection". LastFM. Retrieved 2011-01-11. ^ Phares, Heather. "Cat Power: Jukebox". Allmusic. Retrieved 2011-12-13. ^ Phares, Heather. "Cat Power: The Covers Record". Allmusic. Retrieved 2011-12-13. ^ a b Ruhlmann, William. "Chad & Jeremy: I Don't Want to Lose You, Baby". Allmusic. Retrieved 2010-12-31. ^ "Michael Chapman: The Man Who Hated Mornings". Allmusic. Retrieved 2010-12-26. ^ a b c Sendra, Tim. "Cher: All I Really Want to Do". Allmusic. Retrieved 2010-12-30. ^ a b c Deming, Mark. "Cher: 3614 Jackson Highway". Allmusic. Retrieved 2010-12-29. ^ Viglione, Joe. "Cher: Backstage". AllMusic. Retrieved 2011-02-16. ^ Fink, Matt. "Vic Chesnutt: Drunk". AllMusic. Retrieved 2011-01-29. ^ "Billy Childish: My First Billy Childish Album". AllMusic. Retrieved 2011-01-26. ^ Eder, Bruce. "The Chocolate Watchband: The Inner Mystique". Allmusic. Retrieved 2011-01-10. ^ "Clancy Brothers: Older But No Wiser". Allmusic. Retrieved 2010-12-31. ^ Winick, Steve. "Review: The Dutchman". Allmusic. Retrieved 2014-03-19. ^ Erlewine, Stephen Thomas. "Eric Clapton: Pilgrim". Allmusic. Retrieved 2010-12-31. ^ Ruhlmann, William. "Eric Clapton: Backless". Allmusic. Retrieved 2010-12-31. ^ a b c d e f g "Grateful Dead Family Discography: Knockin' on Heaven's Door". deaddisc.com. Retrieved 2009-10-26. ^ Ruhlmann, William. "Eric Clapton: No Reason to Cry". AllMusic. Retrieved 2011-01-20. ^ a b Chrispell, James. "Gene Clark: Flying High". Allmusic. Retrieved 2010-12-31. ^ "Kelly Clarkson: Kelly, Kelly, Kelly – Live on American Idol". LastFM. Retrieved 2011-01-17. ^ a b Deming, Mark. "The Coal Porters: Chris Hillman Tribute". AllMusic. Retrieved 2011-01-26. ^ "Cobra Skulls: 'Subterranean Homesick Blues'". Amazon.com. Retrieved 2011-01-26. ^ Cook, Stephen. "Joe Cocker:Joe Cocker". Allmusic. Retrieved 2010-12-29. ^ Ruhlmann, William. "Joe Cocker: Organic". Allmusic. Retrieved 2010-12-30. ^ Eder, Bruce. "Joe Cocker: Mad Dogs & Englishmen". Allmusic. Retrieved 2010-12-28. ^ a b Erlewine, Stephen Thomas. "Joe Cocker: Long Voyage Home". Allmusic. Retrieved 2010-12-29. ^ Chrispell, James. "Joe Cocker: Stingray". Allmusic. Retrieved 2010-12-30. ^ Erlewine, Stephen Thomas. "Joe Cocker: Hymn for My Soul". Allmusic. Retrieved 2010-12-30. ^ Ruhlmann, William. "Joe Cocker: Sheffield Steel". Allmusic. Retrieved 2010-12-30. ^ Leggett, Steve. "Joe Cocker: Luxury You Can Afford". Allmusic. Retrieved 2010-12-28. ^ a b c d e f g h i j k l m n o p q "Second Hand Songs". secondhandsongs.com. Retrieved 2009-10-24. ^ Roach, Pemberton. "Judy Collins: Judy Collins Sings Dylan...Just Like a Woman". Allmusic. Retrieved 2010-12-31. ^ "iTunes Preview". Judy Collins 3. iTunes. Retrieved 2010-12-19. ^ Greenwald, Matthew. "Judy Collins: Fifth Album". Allmusic. Retrieved 2010-12-31. ^ "Ray Conniff: Coleccion Mi Historia". AllMusic. Retrieved 2011-01-31. ^ Gottlieb, Bob. "Ry Cooder: The Slide Area". Allmusic. Retrieved 2010-12-28. ^ Pruett, Jon. "Rita Coolidge: The Lady's Not for Sale". Allmusic. Retrieved 2010-12-31. ^ Viglione, Joe. "Rita Coolidge: Nice Feelin". Allmusic. Retrieved 2010-12-31. ^ a b c d e f g h i j k l "Coulson, Dean, McGuinness, Flint: Lo and Behold". AllMusic. Retrieved 2011-01-20. ^ Eder, Bruce. "The Country Gentlemen: The Early Rebel Recordings, 1962–1971". Allmusic. Retrieved 2011-01-10. ^ Erlewine, Stephen Thomas. "Cracker: Garage d'Or". AllMusic. Retrieved 2011-01-26. ^ "Crocodiles: "Outlaw Blues" (one-sided single)". Discogs. Retrieved 2010-12-31. ^ Tamarkin, Jeff. "Crooked Still: Shaken by a Low Sound". Allmusic. Retrieved 2010-12-23. ^ Tilland, William. "Sheryl Crow: Artist's Choice: Sheryl Crow". AllMusic. Retrieved 2011-01-20. ^ "Sheryl Crow:Golden Ballads '99". AllMusic. Retrieved 2011-01-20. ^ Erlewine, Stephen Thomas. "Sheryl Crow: Sheryl Crow and Friends: Live in Central Park". AllMusic. Retrieved 2011-01-20. ^ "Crowded House: Deep Cuts". Amazon.com. Retrieved 2010-12-31. ^ Campbell, Al. "King Curtis: Have Tenor Sax Will Blow: Live at Small's Paradise". AllMusic. Retrieved 2011-01-31. ^ a b Griffith, JT. "Bobby Darin: Golden Folk Hits". Allmusic. Retrieved 2010-12-24. ^ Monger, James Christopher. "Danu: When All Is Said and Done". AllMusic. Retrieved 2011-01-26. ^ "Various Artists: Another Day in Paradise (soundtrack)". Allmusic. Retrieved 2014-01-11. ^ "Chris de Burgh: Footsteps". AllMusic. Retrieved 2011-04-11. ^ "Sandy Denny: No More Sad Refrains: The Anthology". aol.com.uk. Retrieved 2010-12-26. ^ Hartenbach, Brett. "Sandy Denny: The North Star Grassman and the Ravens". Allmusic. Retrieved 2010-12-26. ^ Eder, Bruce. "Sandy Denny: Sandy Denny, Trevor Lucas and Friends: The Attic Tracks 1972–1984". Allmusic. Retrieved 2010-12-28. ^ PLaner, Lindsay. "Sandy Denny: A Boxful of Treasures". Allmusic. Retrieved 2010-12-26. ^ a b c "Jackie DeShannon". Amazon.com. Retrieved 2010-12-27. ^ "Devlin – Watchtower ft. Ed Sheeran". Retrieved 17 August 2012. ^ Jurek, Thom. "Neil Diamond: Home Before Dark". AllMusic. Retrieved 2011-01-17. ^ Lankford, Jr., Ronnie D. "Hazel Dickens: It's Hard to Tell the Singer from the Song". Allmusic. Retrieved 2010-12-26. ^ "Marlene Dietrich: The Essential Marlene Dietrich". Allmusic. Retrieved 2010-12-26. ^ Henderson, Alex. "The Dillards: Let It Fly". Allmusic. Retrieved 2010-12-28. ^ Unterberger, Richie. "Dion: Wonder Where I'm Bound". amazon.com. Retrieved 2010-12-26. ^ "Dion: Dream on Fire". AllMusic. Retrieved 2011-01-29. ^ "Dion: Return of the Wanderer". AllMusic. Retrieved 2011-01-29. ^ Unterberger, Richie. "Dion: Dion". Allmusic. Retrieved 2010-12-26. ^ a b c d Sendra, Tim. "Dino, Desi & Billy: I'm a Fool". AllMusic. Retrieved 2011-01-29. ^ "Dino, Desi & Billy: Memories Are Made of This". Discogs. Retrieved 2011-01-29. ^ Thompson, Dave. "Dr. Feelgood: Classic". AllMusic. Retrieved 2011-03-03. ^ "Nick Drake: Time Has Told Me". AllMusic. Retrieved 2011-01-20. ^ Mason, Sewart. "The Dream Syndicate: The Complete Live at Raji's". AllMusic. Retrieved 2011-04-11. ^ a b Erlewine, Stephen Thomas. "Ducks Deluxe: Side Tracks & Smokers". Allmusic. Retrieved 2011-04-03. ^ "Duran Duran: Thank You". Allmusic. Retrieved 2010-12-27. ^ a b c "Grateful Dead Family Discography: Ballad of a Thin Man". deaddisc.com. Retrieved 2009-10-22. ^ a b c d e f g h i j k l m n o p q r s t u v w x y z aa ab ac ad ae af ag ah ai "Second Hand Songs". secondhandsongs.com. Retrieved 2009-10-14. ^ Kellman, Andy. "Echo & the Bunnymen: Crystal Days: 1979–1999". Allmusic. Retrieved 2011-01-10. ^ a b c d e f g "Duane Eddy: Duane Eddy Does Dylan". Discogs. Retrieved 2011-01-31. ^ Erlewine, Stephen Thomas. "Dave Edmunds: Rockpile". AllMusic. Retrieved 2011-01-17. ^ Jurek, Thom. "Eels: With Strings: Live at Town Hall". Allmusic. Retrieved 2010-12-28. ^ Collar, Matt. "Duke Ellington: Ellington '65". Allmusic. Retrieved 2010-12-27. ^ Lankford, Jr., Ronnie D. "Ramblin' Jack Elliott: Young Brigham". Allmusic. Retrieved 2010-12-23. ^ a b c d Grady, Ronnie. "Ramblin' Jack Elliott: Bull Durham Sacks and Railroad Tracks". Allmusic. Retrieved 2010-12-23. ^ a b Owens, Thomas. "Ramblin' Jack Elliott: Friends of Mine". Allmusic. Retrieved 2010-12-23. ^ Ruhlmann, William. "Ramblin' Jack Elliott: Kerouac's Last Dream". Allmusic. Retrieved 2010-12-23. ^ a b Loren, Marc. "Emerson, Lake & Palmer: In the Hot Seat". AllMusic. Retrieved 2011-01-17. ^ "Entombed: Sons Of Satan Praise The Lord". Amazon.com. Retrieved 2011-01-17. ^ Nathan, Dave. "Paul Evans: Roses Are Red, My Love". AllMusic. Retrieved 2011-01-17. ^ Ollio, J.P. "Everly Brothers: Born Yesterday". Allmusic. Retrieved 2010-12-28. ^ Ollio, J.P. "Everly Brothers: EB 84". Allmusic. Retrieved 2010-12-28. ^ Unterberger, Richie. "Fairport Convention: Unhalfbricking". Allmusic. Retrieved 2010-12-26. ^ a b c d e f g h i "Second Hand Songs". secondhandsongs.com. Retrieved 2010-12-26. ^ a b Nickson, Chris. "Fairport Convention: Cropredy Capers: 25 Years of Fairport Convention and Friends at Cropredy Festival". Allmusic. Retrieved 2010-12-28. ^ Monger, James Christopher. "Fairport Convention: The Quiet Joys of Brotherhood". Allmusic. Retrieved 2010-12-28. ^ "Percy Faith: Great Folk Themes: American Serenade". Amazon.com. Retrieved 2011-01-31. ^ a b c d e f "Grateful Dead Family Discography: It Takes a Lot to Laugh". deaddisc.com. Retrieved 2009-10-26. ^ a b c d "Grateful Dead Family Discography: Visions of Johanna". deaddisc.com. Retrieved 2009-10-15. ^ "José Feliciano: The Voice & Guitar of José Feliciano". Allmusic. Retrieved 2010-12-27. ^ "José Feliciano: Souled". Allmusic. Retrieved 2010-12-27. ^ "José Feliciano: Memphis Menu". Allmusic. Retrieved 2010-12-27. ^ "José Feliciano: A Bagful of Soul". Allmusic. Retrieved 2010-12-27. ^ "Julie Felix: Going to the Zoo". AllMusic. Retrieved 2011-01-26. ^ a b "Julie Felix: Highway of Diamonds". Amazon.com. Retrieved 2011-01-26. ^ a b c d e f g h i "Julie Felix: Masters Of War". Amazon.com. Retrieved 2011-01-26. ^ Viglione, Joe. "Ferrante & Teicher: Getting Together". AllMusic. Retrieved 2011-01-29. ^ a b c d e f g "Grateful Dead Family Discography: All Along the Watchtower". deaddisc.com. Retrieved 2009-10-09. ^ a b c d e f g h Erlewine, Stephen Thomas. "Dylanesque". allmusic.com. Retrieved 2009-10-12. ^ Raggett, Ned. "Bryan Ferry: These Foolish Things". Allmusic. Retrieved 2010-12-31. ^ Raggett, Ned. "Bryan Ferry: Another Time, Another Place". Allmusic. Retrieved 2010-12-28. ^ a b c d e "Grateful Dead Family Discography: Just Like Tom Thumb's Blues". deaddisc.com. Retrieved 2009-10-14. ^ Deming, Mark. "The Flamin' Groovies: Jumpin' in the Night". Allmusic. Retrieved 2011-04-03. ^ a b c d e f g h i j k Jurek, Thom. "Flatt & Scruggs: 1964–1969, Plus". Allmusic. Retrieved 2010-12-30. ^ DeWitt, Howard A. "The Fleetwoods – Then and Now: Teen Angst and Soft Rock 'n Roll". The Fleetwoods Official Website. Retrieved 2011-01-19. ^ Erlewine, Stephen Thomas. "Flying Burrito Brothers: Farther Along: The Best of the Flying Burrito Brothers". Allmusic. Retrieved 2010-12-29. ^ Deming, Mark. "The Flying Burrito Brothers: Burrito Deluxe". Allmusic. Retrieved 2010-12-27. ^ Hartenbach, Brett. "The Flying Burrito Brothers". Allmusic. Retrieved 2010-12-27. ^ Bush, Nathan. "The Flying Burrito Brothers: Live from Amsterdam 1985". Allmusic. Retrieved 2010-12-27. ^ "The Flying Pickets: Lost Boys". AllMusic. Retrieved 2011-02-16. ^ a b "Sue Foley: Big City Blues". AllMusic. Retrieved 2011-01-19. ^ "Sue Foley: Back to the Blues". AllMusic. Retrieved 2011-01-19. ^ a b c d e f Haney, Shawn M. "The 4 Seasons Sing Big Hits by Burt Bacharach...Hal David...Bob Dylan". Allmusic. Retrieved 2010-12-27. ^ Yanow, Scott. "Bill Frisell: Have a Little Faith". Allmusic. Retrieved 2010-12-30. ^ "Bill Frisell: Further East/Further West". AllMusic. Retrieved 2011-02-16. ^ Raggett, Ned. "The Frogs: Hopscotch Lollipop Sunday Surprise". Allmusic. Retrieved 2013-07-16. ^ Jurek, Thom. "Tony Furtado: These Chains". AllMusic. Retrieved 2011-01-29. ^ Yanow, Scott. "The Gadd Gang: The Gadd Gang". AllMusic. Retrieved 2011-01-17. ^ Dryden, Ken. "Jerry Garcia & David Grisman: Been All Around This World". AllMusic. Retrieved 2011-01-26. ^ Planer, Lindsay. "Jerry Garcia Band: Shining Star". Allmusic. Retrieved 2012-12-01. ^ "Grateful Dead Family Discography: Simple Twist of Fate". deaddisc.com. Retrieved 2009-12-20. ^ a b c "Grateful Dead Family Discography: Tangled Up in Blue". deaddisc.com. Retrieved 2009-11-26. ^ a b c "Grateful Dead Family Discography: When I Paint My Masterpiece". deaddisc.com. Retrieved 2009-11-27. ^ Roach, Penelope. "Stan Getz: Reflections". Allmusic. Retrieved 2011-01-10. ^ Anderson, Rick. "Thea Gilmore: Songs from the Gutter". AllMusic. Retrieved 2011-01-29. ^ a b "Second Hand Songs". secondhandsongs.com. Retrieved 2009-10-14. ^ Jurek, Thom. "Gov't Mule: Mulennium". Allmusic. Retrieved 2010-12-30. ^ Unterberger, Richie. "The Grass Roots: Where Were You When I Needed You". AllMusic. Retrieved 2011-01-17. ^ a b "Grateful Dead Family Discography: Desolation Row". deaddisc.com. Retrieved 2009-12-13. ^ "Grateful Dead Family Discography: Man of Peace". deaddisc.com. Retrieved 2009-11-27. ^ a b c Luecking, Eric. "David Gray: A Thousand Miles Behind". Allmusic. Retrieved 2010-12-28. ^ "The Grease Band: Amazing Grease". AllMusic. Retrieved 2011-01-31. ^ Loftus, Johnny. "Nanci Griffith: Other Voices, Other Rooms". Allmusic. Retrieved 2010-12-27. ^ "Not Dark Yet – Trey Gunn". Bandcamp. Retrieved 2015-05-28. ^ Newsom, Jim. "Arlo Guthrie: The Last of the Brooklyn Cowboys". AllMusic. Retrieved 2011-01-17. ^ Unterberger, Richie. "Arlo Guthrie: Washington County". AllMusic. Retrieved 2011-01-17. ^ Newsom, Jim. "Arlo Guthrie: Hobo's Lullaby". AllMusic. Retrieved 2011-01-17. ^ Westergaard, Sean. "Buddy Guy: Bring 'Em In". AllMusic. Retrieved 2011-01-29. ^ Erlewine, Stephen Thomas. "Porky's Revenge". Allmusic. Retrieved 2010-12-26. ^ a b c d e f "Second Hand Songs". secondhandsongs.com. Retrieved 2009-10-14. ^ Erlewine, Stephen Thomas. "The Edwin Hawkins Singers: Christmas". AllMusic. Retrieved 2011-01-31. ^ "Robert Hazard: Robert Hazard". Discogs. Retrieved 2011-01-31. ^ "The Jeff Healey Band: Live at Grossmans 1994". AllMusic. Retrieved 2011-04-11. ^ Campbell, Al. "Heart: The Essential Heart". Allmusic. Retrieved 2010-12-30. ^ Jurek, Thom. "Michael Hedgers: Platinum & Gold Collection". Allmusic. Retrieved 2010-12-28. ^ Deming, Mark. "Richard Hell & the Voidoids: Destiny Street". Allmusic. Retrieved 2017-04-29. ^ Heibutzki, Ralph. "The Heptones: Party Time". Allmusic. Retrieved 2011-01-14. ^ Carino, Paula. "Carolyn Hester: We Dream Forever". Allmusic. Retrieved 2010-12-28. ^ Tamarkin, Jeff. "Dan Hicks: Tangled Tales". Allmusic. Retrieved 2011-01-14. ^ a b "The Hillmen: The Hillmen". The Hillmen. Allmusic. Retrieved 2010-12-19. ^ Worbois, Jim. "Chris Hillman: Morning Sky". Allmusic. Retrieved 2010-12-28. ^ a b c d e f g h i j Downing, Brian. "Robyn Hitchcock: Robyn Sings". allmusic.com. Retrieved 2009-10-22. ^ Monger, James Christopher. "Robyn Hitchcock & the Egyptians: Luminous Groove". Allmusic. Retrieved 2010-12-28. ^ "Hole: 'It's All Over Now, Baby Blue' (single)". Amazon.com. Retrieved 2011-01-14. ^ a b c d e f g h i j k l "Second Hand Songs". secondhandsongs.com. Retrieved 2009-10-14. ^ "Hot Tuna: Live at Sweetwater". Allmusic. Retrieved 2010-12-31. ^ a b c d e f g h i j k l Mason, Stewart. "Portraits of Bob Dylan". allmusic.com. Retrieved 2009-10-22. ^ Unterberger, Richie. "Ian & Sylvia: Four Strong Winds". Allmusic. Retrieved 2010-12-28. ^ Jurek, Thom. "Indigo Girls: Staring Down the Brilliant Dream". Allmusic. Retrieved 2010-12-27. ^ Erlewine, Stephen Thomas. "Various Artists: Unexpected Dreams". AllMusic. Retrieved 2011-01-17. ^ "Iskra: Iskra". LastFM. Retrieved 2011-02-16. ^ a b c Unterberger, Richie. "How Many Roads: Black America Sings Bob Dylan, Various Artists". Allmusic. Retrieved 2010-12-29. ^ a b c d Unterberger, Richie. "Burl Ives: The Times They Are A-Changin'". Allmusic. Retrieved 2010-12-28. ^ Eder, Bruce. "Jan & Dean: Surf City/Folk 'n Roll". Allmusic. Retrieved 2010-12-28. ^ Viglione, Joe. "Spring". Allmusic. Retrieved November 24, 2015. ^ "Heroes of Woodstock: Various Artists". Allmusic. Retrieved 2010-12-28. ^ Lankford, Jr., Ronnie D. "Eilen Jewell: Sinners & Strangers". Allmusic. Retrieved 2015-02-22. ^ Erlewine, Stephen Thomas. "Billy Joel: My Lives". AllMusic. Retrieved 2011-03-03. ^ "Billy Joel: Singles & EPs". AllMusic. Retrieved 2011-01-17. ^ "Wilko Johnson: Solid Senders". AllMusic. Retrieved 2011-03-03. ^ Erlewine, Stephen Thomas. "Janice Joplin: The Collection". Allmusic. Retrieved 2010-12-30. ^ a b c d e f g h i j k l m n o p q r s "Second Hand Songs". secondhandsongs.com. Retrieved 2009-10-14. ^ "Peter Keane: Milton Street". Allmusic. Retrieved 2011-01-10. ^ "Peter Kean: Walkin' Around". Allmusic. Retrieved 2011-01-10. ^ Renne, Chip Renner; Richard Meyer. "Peter Keane: The Goodnight Blues". Allmusic. Retrieved 2010-12-28. ^ O'Brien, Jon. "Ronan Keating: Songs for My Mother". AllMusic. Retrieved 2011-01-17. ^ "The Kennedys: "Half a Million Miles". Allmusic. Retrieved 2010-12-31. ^ Hannusch, Jeff. "Doug Kershaw: Louisiana Man Compilation". AllMusic. Retrieved 2011-01-21. ^ McDonald, Steven. "Greg Kihn: Mutiny". AllMusic. Retrieved 2011-01-26. ^ a b Hamilton, Andrew. "Ben E. King: Rough Edges". Allmusic. Retrieved 2010-12-29. ^ Eder, Bruce. "The Kingston Trio: Once Upon a Time". Allmusic. Retrieved 2010-12-28. ^ Eder, Bruce. "Review: Kingston Trio: Nick Bob John". Allmusic. Retrieved 2010-12-19. ^ a b Tamarkin, Jeff. "The Kingston Trio: The Final Concert". Allmusic. Retrieved 2010-12-28. ^ Greenberg, Adam. "Ladysmith Black Mambazo: Ultimate Collection". AllMusic. Retrieved 2011-01-17. ^ Eder, Bruce. "The Leaves: Hey Joe". AllMusic. Retrieved 2011-01-22. ^ a b c d "Second Hand Songs". secondhandsongs.com. Retrieved 2009-10-14. ^ "Phil Lesh & Friends: Instant Live: Tampa Bay Performing Arts Center – Tampa, FL 6/23/06". AllMusic. Retrieved 2011-09-15. ^ Yanow, Scott. "Ramsey Lewis: Maiden Voyage (And More)". Allmusic. Retrieved 2010-12-24. ^ "The Lettermen: More Hit Sounds of the Lettermen". AllMusic. Retrieved 2011-01-22. ^ Parisien, Roch. "Gordon Lightfoot: Waiting for You". Allmusic. Retrieved 2010-12-27. ^ Planer, Lindsay. "Julie London: Yummy, Yummy, Yummy". AllMusic. Retrieved 2016-03-07. ^ a b "Trini Lopez: The Folk Album". AllMusic. Retrieved 2011-01-22. ^ Chadbourne, Eugene. "Lulu: It's Lulu". Allmusic. Retrieved 2014-11-02. ^ Eder, Bruce. "Magna Carta: Putting It Back Together". AllMusic. Retrieved 2011-01-30. ^ a b c "The Mandreds". themanfreds.com. Archived from the original on April 13, 2009. Retrieved 2009-10-15. ^ a b c d e f g h "Manfred Mann's Earth Band". Creature Music. Retrieved 2009-10-15. ^ Erlewine, Stephen Thomas. "Frank Marino & Mahogany Rush: Dragonfly: The Best of Frank Marino & Mahogany Rush". AllMusic. Retrieved 2015-02-22. ^ "Laura Marling Covers Bob Dylan's "A Hard Rain's a-Gonna Fall": Listen | Pitchfork". pitchfork.com. Retrieved 2018-07-17. ^ a b c d e f g h i j Wilson, MacKenzie. "Mary Lee's Corvette: Blood on the Tracks". Allmusic. Retrieved 2010-12-28. ^ Ruhlmann, William. "Dave Mason: Dave Mason". Allmusic. Retrieved 2010-12-28. ^ "Brother Jack McDuff: Tobacco RoadSteve Huey". AllMusic. Retrieved 2011-01-31. ^ a b Viglione, Joe. "Barry McGuire: Eve of Destruction". Allmusic. Retrieved 2010-12-23. ^ Ruhlmann, William. "Barry McGuire: The World's Last Private Citizen". Allmusic. Retrieved 2010-12-23. ^ "MacKendree Spring: First Album". AllMusic. Retrieved 2011-01-26. ^ a b c d e "Ralph McTell: Gates of Eden". Allmusic. Retrieved 2010-12-28. ^ a b c d e "Second Hand Songs". secondhandsongs.com. Retrieved 2009-10-14. ^ "John Mellencamp: Rough Harvest". AllMusic. Retrieved 2011-01-26. ^ Ruhlmann, William. "Bette Midler: Songs for the New Depression". Allmusic. Retrieved 2010-12-28. ^ Cummings-Yeates, Rosalind. "Jacob Miller: Chapter a Day: Jacob Miller Song Book". Allmusic. Retrieved 2010-12-29. ^ "Subterranean Homesick Blues: A Tribute to Bob Dylan's 'Bringing It All Back Home'". Amazon.com. Retrieved 2012-01-07. ^ Ginell, Cary. "Chad Mitchell Trio: Blowin' in the Wind". Allmusic. Retrieved 2011-01-10. ^ Foss, Richard. "Chad Mitchell Trio: That's the Way It's Gonna Be". Allmusic. Retrieved 2011-01-10. ^ Foss, Richard. "Chad Mitchell Trio: Typical American Boys". Allmusic. Retrieved 2011-01-10. ^ Winick, Steve. "Christy Moore: Prosperous". AllMusic. Retrieved 2011-01-29. ^ Nickson, Chris. "Christy Moore: Burning Times". AllMusic. Retrieved 2011-01-29. ^ Collette, Doug (2008-11-08). "Van Morrison: Remasters Redux". Retrieved 2009-10-15. ^ "iTunes Preview". Dmytro Morykit. ^ a b c d e f g h Campbell, Al. "Mountain: Masters of War". Allmusic. Retrieved 2010-12-31. ^ a b c d e f g h i j k l Jurek, Thom. "Maria Muldaur: Heart of Mine". Allmusic. Retrieved 2010-12-28. ^ Dryden, Ken. "Gerry Mulligan: If You Can't Beat 'Em, Join 'Em". AllMusic. Retrieved 2011-01-22. ^ Lankford, Jr., Ronnie D. "Peter Mulvey: Ten Thousand Mornings". AllMusic. Retrieved 2011-01-22. ^ Stepek, Peter. "Youssou N'Dour: Guide (Wommat)". Allmusic. Retrieved 2010-12-28. ^ "Nazareth: Free Wheeler". Allmusic. Retrieved 2010-12-28. ^ "David Nelson Band: Visions Under the Moon". Allmusic. Retrieved 2011-04-03. ^ Swihart, Stanton. "David Nelson Band: Keeper of the Key". Allmusic. Retrieved 2011-04-03. ^ a b c d e Erlewine, Stephen Thomas. "For You: The Decca Years". AllMusic. Retrieved 2012-10-15. ^ a b c Erlewine, Stephen Thomas. "Rick Nelson: The Last Time Around 1970–1982". AllMusic. Retrieved 2012-10-15. ^ "Tracy Nelson: Sweet Soul Music". Allmusic. Retrieved 2010-12-27. ^ Lankford, Jr., Ronnie D. "Tracy Nelson". Allmusic. Retrieved 2010-12-27. ^ Erlewine, Stephen Thomas. "Mike Ness: Cheating at Solitaire". Allmusic. Retrieved 2011-01-10. ^ a b c d "Aaron Nebville". Retrieved 2009-10-24. ^ a b Wynne, Ron. "Neville Brothers: Yellow Moon". Allmusic. Retrieved 2010-12-28. ^ Viglione, Joe. "Olivia Newton-John: "If Not for You". Allmusic. Retrieved 2010-12-31. ^ Planer, Lindsay. "The New Christy Minstrels: New Kick!". AllMusic. Retrieved 2011-01-20. ^ Eder, Bruce. "The New Riders of the Purple Sage: The Best of New Riders of the Purple Sage". AllMusic. Retrieved 2011-01-30. ^ "Various Artisits: Classic Protest Songs from Smithsonian Folkways". Smithsonian Folkways. Retrieved 2011-04-04. ^ Unterberger, Richie. "The Nice: Nice". AllMusic. Retrieved 2011-01-22. ^ Monger, James Christopher. "Nickel Creek: ". Allmusic. Retrieved 2010-12-28. ^ a b "Grateful Dead Family Discography: Just Like a Woman". deaddisc.com. Retrieved 2009-10-26. ^ "Second Hand Songs". secondhandsongs.com. Retrieved 2009-10-16. ^ Fink, Matt. "Nitty Gritty Dirt Band: Live Two Five". Allmusic. Retrieved 2011-01-10. ^ a b c d e f g h i j k l Ashford, William. "Tim O'Brien: Red on Blonde". Allmusic. Retrieved 2010-12-23. ^ a b c d e f g h i j k l "Odetta Sings Dylan". allmusic.com. Retrieved 2010-02-27. ^ Henderson, Alex. "The O'Jays: Emotionally Yours". AllMusic. Retrieved 2011-01-31. ^ "Beth Orton: Heart of Soul". Rolling Stone. Retrieved 2009-10-23. ^ Duffy, John. "Joan Osborne: Righteous Love". AllMusic. Retrieved 2011-01-17. ^ "Gene Parsons: In Concert: I Hope They Let Us In". AllMusic. Retrieved 2011-01-21. ^ Birchmeier, Jason. "Pearl Jam: Benaroya Hall: October 22nd 2003". AllMusic. Retrieved 2011-01-29. ^ Jurek, Thom. "Pearls Before Swine: The Wizard of Is". Allmusic. Retrieved 2011-01-10. ^ "Bart Peeters – Het Plaatje Van Bart Peeters – 14 Nummers Uit "Zonder Circus"". Discogs. Retrieved 2011-03-24. ^ "Slimmer Dan de Zanger – Bart Peeters". Allmusic. Retrieved 2011-03-24. ^ Eder, Bruce. "Carl Perkins: On Top". AllMusic. Retrieved 2011-01-21. ^ a b c d e f g h i j k l m "The Persuasions: Knockin' on Bob's Door". Allmusic. Retrieved 2010-12-28. ^ a b c d e Ruhlmann, William. "Peter, Paul & Mary: The Collection: Their Greatest Hits & Finest Performances". Allmusic. Retrieved 2010-12-29. ^ Unterberger, Richie. "Peter, Paul & Mary: Album 1700". Allmusic. Retrieved 2010-12-28. ^ Erlewine, Stephen Thomas. "Bernadette Peters: I'll Be Your Baby Tonight". AllMusic. Retrieved 2011-01-21. ^ Jurek, Thom. "Madeleine Peyroux: Careless Love". AllMusic. Retrieved 2011-01-21. ^ Unterberger, Richie. "Esther Phillips: The Best of Esther Phillips". Allmusic. Retrieved 2010-12-29. ^ Winick, Steve. "Planxty: Words & Music'". Allmusic. Retrieved 2010-12-31. ^ "Playing for Change: Listen to the Music". Playing for Change website. Retrieved 2018-04-24. ^ "The Pozo Seco Singers: Time/I Can Make It With You". Amazon.com. Retrieved 2011-01-30. ^ Guarisco, Donald A. "Elvis Presley: Tomorrow Is a Long Time". Allmusic. Retrieved 2010-12-28. ^ Valdivia, Victor W. "Billy Preston: Everybody Likes Some Kind of Music". AllMusic. Retrieved 2011-01-21. ^ Eder, Bruce. "Billy Preston: That's the Way God Planned It". Allmusic. Retrieved 2010-12-28. ^ Prato, Greg. "The Pretenders: Greatest Hits". Allmusic. Retrieved 2010-12-28. ^ Erlewine, Stephen Thomas. "Bonnie Raitt: Green Light". Allmusic. Retrieved 2010-12-28. ^ Erlewine, Stephen Thomas. "The Ramones: Acid Eaters". Allmusic. Retrieved 2010-12-27. ^ Meredith, Bill. "Red Hot Chili Peppers: The Uplift Mofo Party Plan". AllMusic. Retrieved 2011-01-21. ^ Nickson, Chris. "Redbird: Redbird". AllMusic. Retrieved 2015-02-22. ^ Prato, Greg. "Noel Redding: West Cork Tunina". Allmusic. Retrieved 2010-12-27. ^ Unterberger, Richie. "Terry Reid". Allmusic. Retrieved 2010-12-27. ^ "John Renbourn: So Early in the Spring". Amazon.com. Retrieved 2011-01-31. ^ Ankeny, Jason. "Review: Cold on the Shoulder". Allmusic. Retrieved 2010-12-19. ^ "Tony Rice: Plays and Sings Bluegrass". Allmusic. Retrieved 2010-12-28. ^ Adams, Greg. "Stan Ridgway: Black Diamond". AllMusic. Retrieved 2011-01-26. ^ Erlewine, Stephen Thomas. "Johnny Rivers: Johnny Rivers Rocks the Folk/Meanwhile Back at the Whisky A-Go-Go". AllMusic. Retrieved 2011-01-31. ^ Unterberger, Richie. "Johnny Rivers: Secret Agent Man: The Ultimate Collection". AllMusic. Retrieved 2011-01-19. ^ a b "Second Hand Songs". secondhandsongs.com. Retrieved 2009-10-24. ^ Erlewine, Stephen Thomas. "Linda Ronstadt: We Ran". Allmusic. Retrieved 2010-12-23. ^ Torreano, Bradley. "Diana Ross: Love from Diana Ross". Allmusic. Retrieved 2010-12-28. ^ Erlewine, Stephen Thomas. "Todd Rundgren: Faithful". Allmusic. Retrieved 2011-01-14. ^ Unterberger, Richie. "Gimme Shelter! : The Best of Leon Russell". Allmusic. Retrieved 2010-12-28. ^ Phares, Heather. "David Sanborn: The Essentials". AllMusic. Retrieved 2011-01-17. ^ "Boz Scaggs: Boz". AllMusic. Retrieved 2011-01-21. ^ "Danny Schmidt: Man of Many Moons". AllMusic. Retrieved 2011-01-22. ^ a b c d e "Earl Scruggs: Changin' Times". Allmusic. Retrieved 2010-12-28. ^ Renner, Chip. "Earl Scruggs: Family Portrait". AllMusic. Retrieved 2011-01-30. ^ Monger, James Christopher. "Earl Scruggs: The Ultimate Collection: Live at the Ryman". Allmusic. Retrieved 2011-01-10. ^ Unterberger, Richie. "The Searchers: 30th Anniversary Collection". AllMusic. Retrieved 2011-01-31. ^ "The Searchers: The Searchers". AllMusic. Retrieved 2011-01-20. ^ Chrispell, John. "Seatrain: Watch". Allmusic. Retrieved 2010-12-28. ^ a b Ruhlmann, William. "Pete Seeger: Little Boxes & Other Broadsides". AllMusic. Retrieved 2011-01-31. ^ Ruhlmann, William. "Broadside Ballads, Vol. 2 (Track Listing)". Allmusic. Retrieved 2010-12-23. ^ Ruhlmann, William. "Pete Seeger: Strangers and Cousins". Allmusic. Retrieved 2010-12-24. ^ a b Eder, Bruce. "The Seekers: The Seekers Complete". Allmusic. Retrieved 2010-12-31. ^ Anderson, Rick. "The Seldom Scene: Scene It All". Allmusic. Retrieved 2010-12-28. ^ Lankford, Jr., Ronnie D. "The Seldom Scene: "Scenechronized". Allmusic. Retrieved 2010-12-28. ^ "The Selecter: Pucker!". AllMusic. Retrieved 2011-01-31. ^ "Selig: Soundtrack "Knockin' on Heaven's Door" & "Für immer und selig"". Retrieved 2015-04-09. ^ "Louise Setara: Still Waters". AllMusic. Retrieved 2011-01-17. ^ Owens, Thom. "Kenny Wayne Shepherd: Trouble Is...". Allmusic. Retrieved 2011-01-10. ^ "Bobby Sherman: Bobby Sherman". AllMusic. Retrieved 2011-01-29. ^ "Show of Hands: Dark Fields". AllMusic. Retrieved 2011-01-26. ^ a b c d e f g h i j k l Jurek, Thom. "Ben Sidran: Dylan Different". AllMusic. Retrieved 2011-01-17. ^ a b c d e f g h Unterberger, Richie. "The Silkie: You've Got to Hide Your Love Away". Allmusic. Retrieved 2010-12-28. ^ "Nina Simone: Souful Anthology: Philips Years". Allmusic. Retrieved 2010-12-28. ^ Erlewine, Stephen Thomas. "Martin Simpson: Grinning in Your Face". AllMusic. Retrieved 2011-02-16. ^ Unterberger, Richie. "Nancy Sinatra: Boots". Allmusic. Retrieved 2010-12-28. ^ "Siouxsie and the Banshees". vamp.com. Retrieved 2009-10-15. ^ a b "Patrick Sky: Through a Window". Allmusic. Retrieved 2010-12-31. ^ "Patti Smith performs Bob Dylan's "A Hard Rain's A-Gonna Fall" - Nobel Prize Award Ceremony 2016". ^ Jurek, Thom. "Patti Smith: Twelve". AllMusic. Retrieved 2011-01-21. ^ Nastos, Michael G. "Chris Smither: Time Stands Still". Allmusic. Retrieved 2010-12-31. ^ Ruhlmann, William. "Phoebe Snow: Rock Away". Allmusic. Retrieved 2010-12-31. ^ Ruhlmann, William. "Spirit: Salvation...The Spirit of '74". AllMusic. Retrieved 2011-01-19. ^ Anderson, Jason. "Spooky Tooth: It's All About". Allmusic. Retrieved 2010-12-31. ^ a b "Staple Singers: This Little Light". AllMusic. Retrieved 2011-02-16. ^ "Ray Stevens: Have a Little Talk with Myself". Allmusic. Retrieved 2010-12-31. ^ "Ray Stevens: Everything Is Beautiful". Allmusic. Retrieved 2010-12-31. ^ Erlewine, Stephen Thomas. "Rod Stewart: Still the Same: Great Rock Classics of Our Time". Allmusic. Retrieved 2010-12-31. ^ Chrispell, James. "Steven Stills: Stills Alone". Allmusic. Retrieved 2010-12-31. ^ a b c "Billy Strange: Folk Rock Hits". Allmusic. Retrieved 2010-12-31. ^ Unterberger, Richie. "Billy Strange: Twelve String Guitar". Allmusic. Retrieved 2010-12-31. ^ Unterberger, Richie. "Billy Strange: Strange Country". Allmusic. Retrieved 2010-12-31. ^ "Billy Strange: Billy Strange Plays the Hits". Amazon.com. Retrieved 2011-01-21. ^ "STS: Gegenlicht". Discogs. Retrieved 2016-04-16. ^ a b "Peel Sessions: June Tabor (1990-11-27)". BBC. Retrieved 2010-12-26. ^ "June Tabor & Huw Warren: Don't Think Twice, It's All Right". YouTube. Retrieved 2010-12-27. ^ Taff, Russ. "Amazon Music". Retrieved December 10, 2017. ^ Orens, Geoff. "Rogert Taylor: Strange Frontier". Allmusic. Retrieved 2011-01-10. ^ Huey, Steve. "Television: The Blow Up". AllMusic. Retrieved 2011-01-17. ^ Deming, Mark. "Texas Tornados: Hangin' on by a Thread". AllMusic. Retrieved 2011-01-31. ^ Sendra, Tim. "George Thorogood: The Hard Stuff". Allmusic. Retrieved 2011-01-10. ^ Thompson, Dave. "Thunderclap Newman: Hollywood Dream'". AllMusic. Retrieved 2011-01-20. ^ "Johnny Tillotson: The EP Collection". AllMusic. Retrieved 2011-01-31. ^ "Frank Tovey: Tyranny & the Hired Hand". Discogs. Retrieved 2011-01-29. ^ Meyer, Richard. "Happy Traum: Bucket of Songs". Allmusic. Retrieved 2010-12-28. ^ "Happy Traum: I Walk the Road Again". Allmusic. Retrieved 2010-12-29. ^ Eder, Bruce. "The Tremeloes: The Best of the Tremeloes". Allmusic. Retrieved 2010-12-31. ^ "Walter Trout: Prisoner of a Dream". Allmusic. Retrieved 2011-01-10. ^ Torreano, Bradley. "T.S.O.L. : Hell & Back Together: 1984–1990". AllMusic. Retrieved 2011-04-11. ^ "Turtle Island String Quartet: Have You Ever Been...?". AllMusic. Retrieved 2011-04-11. ^ "Ike & Tina Turner: The Sensational Ike & Tina Turner". AllMusic. Retrieved 2011-01-31. ^ a b c Eder, Bruce. "The Turtles: It Ain't Me Babe". Allmusic. Retrieved 2010-12-23. ^ Erlewine, Stephen Thomas. "U2 Rattle and Hum". AllMusic. Retrieved 2011-01-19. ^ Leggett, Steve. "Dave Van Ronk: ...And the Tin Pan Bended and the Story Ended". Allmusic. Retrieved 2010-12-23. ^ Ruhlmann, William. "Dave Van Ronk: From...Another Time & Place". Allmusic. Retrieved 2010-12-23. ^ Unterberger, Richie. "Dave Van Ronk: No Dirty Names". Allmusic. Retrieved 2010-12-23. ^ Ruhlmann, William. "Dave Van Ronk: Somebody Else Not Me". Allmusic. Retrieved 2010-12-23. ^ Eder, Bruce. "Dave Van Ronk: To All My Friends in Far-Flung Places". AllMusic. Retrieved 2011-01-26. ^ a b McCartney, Kelly. "Townes Van Zandt: Roadsongs". Allmusic. Retrieved 2010-12-27. ^ "Caeton Veloso: Circulado Vivo". AllMusic. Retrieved 2011-01-19. ^ "The Ventures: Flights of Fantasy". Allmusic. Retrieved 2010-12-31. ^ a b "Village Stompers: More Sounds of Washington Square". Allmusic. Retrieved 2010-12-31. ^ "Jerry Jeff Walker: Cow Jazz". Discogs. Retrieved 2011-01-30. ^ Jurek, Thom. "Jerry Jeff Walker: A Man Must Carry On". AllMusic. Retrieved 2010-12-28. ^ Ruhlmann, William. "Jennifer Warnes: See Me, Feel Me, Touch Me". AllMusic. Retrieved 2011-01-19. ^ Viglione, Joe. "Dionne Warwick: Here Where There Is Love". AllMusic. Retrieved 2011-01-19. ^ Beatty, Brian. "The Waterboys: Live Adventures of the Waterboys". AllMusic. Retrieved 2014-09-14. ^ "Doc Watson: Round the Table Again". Allmusic. Retrieved 2010-12-23. ^ Eder, Bruce. "We Five: Catch the Wind". AllMusic. Retrieved 2011-01-19. ^ Erlewine, Stephen Thomas. "Paul Weller: Studio 150". AllMusic. Retrieved 2011-01-21. ^ "Kitty Wells: Forever Young". AllMusic. Retrieved 2011-01-26. ^ a b Unterberger, Richie. "The West Coast Pop Art Experimental Band: West Coast Pop Art Experimental Band, Vol. I". AllMusic. Retrieved 2011-01-10. ^ Huey, Steve. "Chris Whitley: Perfect Day". AllMusic. Retrieved 2011-01-29. ^ "Various Artists: In Their Own Words, Vol. 1". AllMusic. Retrieved 2013-11-13. ^ "Robin Williamson: Just Like the River and Other Songs for Guitar". Amazon.com. Retrieved 2011-04-03. ^ "Cassandra Wilson: Closer to You: The Pop Side". Amazon.com. Retrieved 2011-01-19. ^ Adler, David R. "Cassandra Wilson: Belly of the Sun". AllMusic. Retrieved 2011-01-19. ^ Eder, Bruce. "Winter Hours: Wait 'Till the Morning". AllMusic. Retrieved 2015-02-22. ^ "Svensk mediedatabas". Retrieved 26 April 2011. ^ Elias, Jason. "Bobby Womack: The Facts of Life". AllMusic. Retrieved 2011-01-19. ^ La Gorce, Tammy. "The Wood Brothers: Loaded". AllMusic. Retrieved 2010-12-28. ^ Erlewine, Iotis. "World Party: Private Revolution". AllMusic. Retrieved 2011-01-26. ^ Woodstra, Chris. "XTC: White Music". AllMusic. Retrieved 2011-01-22. ^ Unterberger, Richie. "Glenn Yarbrough: "For Emily, Whenever I May Find Her". Allmusic. Retrieved 2010-12-27. ^ "Hope Floats"Music from the Motion Picture". Amazon.com. Retrieved 2011-01-17. ^ a b c Monger, James Christopher. "Yes: Yes and Friends". Allmusic. Retrieved 2010-12-28. ^ Ruhlmann, William. "Neil Young & Crazy Horse: Weld". AllMusic. Retrieved 2011-01-31. ^ Gardner, James A. "The Youngbloods: High on a Ridgetop". Allmusic. Retrieved 2010-12-27. ^ Deming, Mark. "Warren Zevon: The Wind". AllMusic. Retrieved 2011-01-17. This page was last edited on 6 April 2019, at 22:23 (UTC).